This consisted of a loom that had two rollers. These rollers were used to stretch the plain warp threads -or the load-bearing threads. For large scale production, warps made out of wool were used in France and the modern-day Belgium. The warps got stretched vertically on the high-warp looms, while being horizontal on the low-warp loom. The reverse side of the tapestry was where the weavers worked. There was always a tiny space known as the shed between the odd and the even warps. This is where the coloured weft threads were passed through. These threads were wrapped around handheld shuttles. Draw strings were used for attaching alternate warps so that the weavers could pull them forward and backward to create sheds. The wefts were inserting by passing them back and forth through sheds – once over the warp and once below. This was repeated in the opposite direction too. The developing web was often beaten by the weaver to completely cover the warps by the weft. Patterns or figurative images were created by varying the colours of weft. Somewhere during the period 1400 to 1530, the Flemish weavers came up with a technique to bring about painterly effects or different surface textures by using hatchings or hachures, juxtaposing different materials and using different techniques to link weft threads. You can see this in the famous tapestries such as Scene from the Trojan War, Last Supper, Triumph of Fame and the Bridal Chamber of Herse. This was when the cartoon was introduced. A cartoon is usually a painting or a fully coloured pattern whose design is copied on to the weaving of tapestry. The practice is followed even today. Here, the weaver will first trace the pattern onto the bare warps. The high-warp loom is used to hang the cartoon behind the weaver. The low warp loom is used to fold or cut the cartoon into tiny strips, which are then placed beneath the warp threads directly. This technique makes it easier for the weaver to weave even the most complicated of the designs. In this technique the drawstrings were controlled using foot pedals. All that the weaver had to do was pass the weft between the sheds that were thus created. Although this technique offered excellent speed in terms of production and allowed the weavers to reproduce even complex designs, this would often reverse the orientation of the cartoon. Therefore, the cartoons had to be re-designed in the opposite direction for the purpose of tapestry weaving. The cartoon from which the actual pattern or design is copied: The quality of cartoon had to be excellent for the result to turn out good. It had to be designed well, keeping in mind the outcome of the tapestry. Weavers’ skills to translate that design into a woven tapestry: This depended on how well the weavers understood the design and could replicate the same during weaving. The fineness of the weave: This depends on the grade of the weft and the number of warps per centimetre. This directly affects the pictorial quality of the tapestry and its precision. The quality of the material: The better the quality of the materials used, the better would be the quality of the tapestry. The pricing of the tapestries started varying during this period due to the differences in their quality. This had a lot to do with the manpower that was involved. Production of tapestries became labour-intensive, requiring too many skilled weavers in order to make large tapestries. In about one month, the weavers used to weave about one square yard of tapestry that was coarse. Where the tapestries involved finer weft and warp count, the production was slower, with them managing to weave about half a square yard in a month. So, if they had to weave a large tapestry which was five yards in height and eight in width, it would take about 5 workers and 8 months to finish. The warp count would be about fifteen per inch. This would take much longer for higher warp counts and finer materials. For instance, it would take about 8 to 16 months for 30 weavers to produce a tapestry set that included six 5 by 8 yard tapestries. This does not include the time involved in the designing and preparation of cartoons and the setting up of looms. 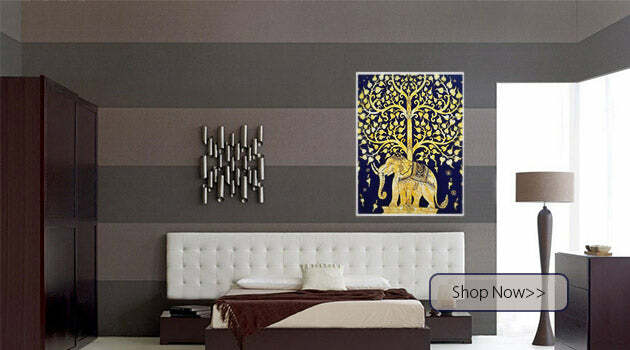 The material was one more factor that made a huge difference in the pricing of a tapestry. The wool that was used for weft and warps came generally from England or Spain. The silk for the finer-quality pieces came from Italy or Spain. The silver-and-gilt-metal-wrapped silk thread was imported from Cyprus or Venice. The cost of Tapestries woven with silk was four times more than the woollen ones in sixteenth century. The metallic thread made it even costlier, going up to 20 times more than the cost of woollen tapestries. There is documentary evidence that shows this extreme variation in pricing. However, in most cases it did depend on the circumstances during which such tapestries were manufactured and sold. Although some of the old techniques are still in force, there have been a lot of changes in the looms, the materials and fineness with which tapestries are woven in the modern days. They have also become much more affordable making it possible for every common man to hang one on his walls. The designs are innumerable and the choices are unlimited. 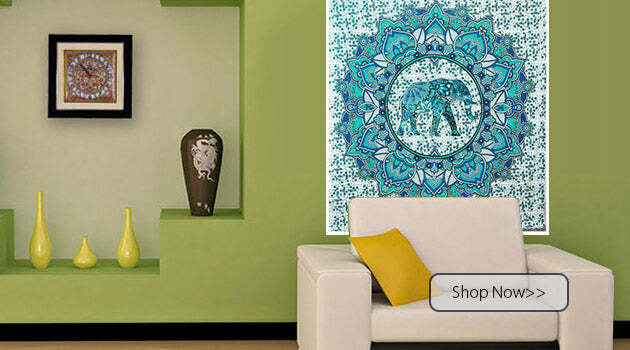 Tapestries are still the best way to decorate your homes, no matter which part of the world you are in.